Hampton Art Blog: Echo Park/Hampton Art blog hop! Echo Park/Hampton Art blog hop! 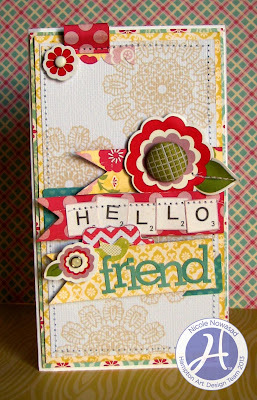 Welcome to the Hampton Art/Echo Park Paper Co. Blog Hop! If you didn't know by now, Echo Park and Hampton Art have teamed up to create beautiful stamps that coordinate with the Echo Park designs. 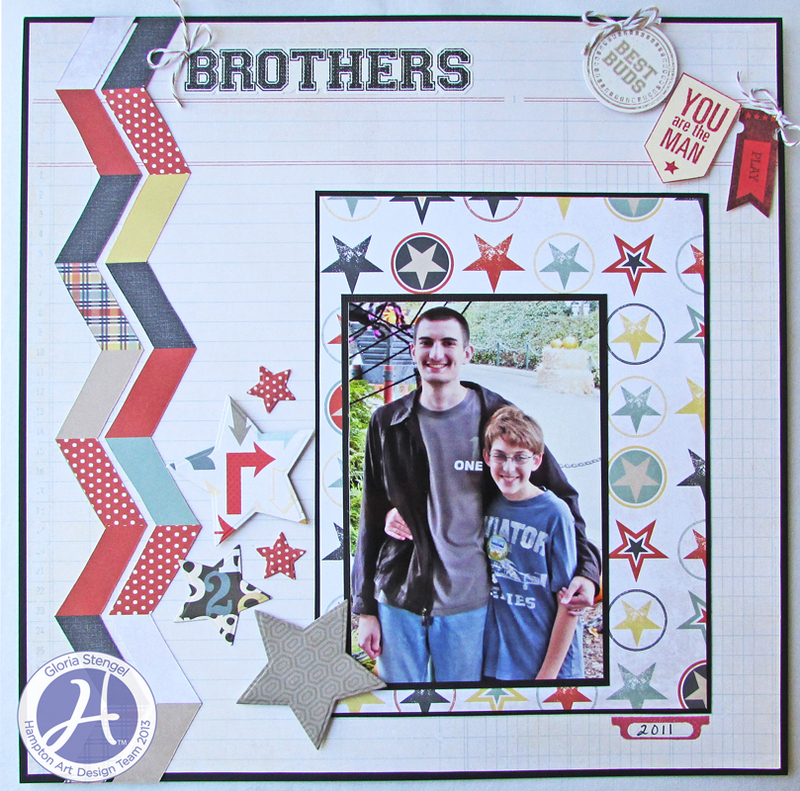 Today we have a great blog hop filled with projects from both Design Teams, featuring Echo Park's latest collections and especially the coordinating, Hampton Art stamps! Grab your favorite beverage, kick back and enjoy all the inspiration! Woot Woot! 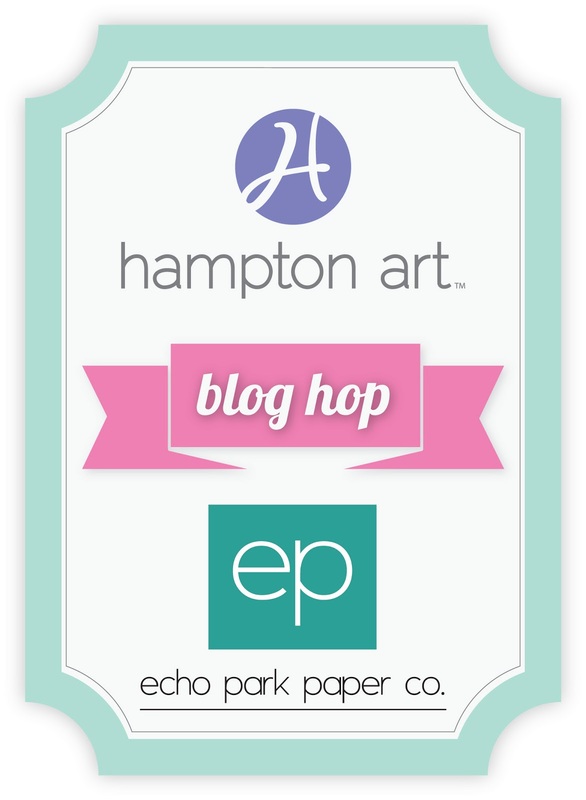 Giveaway: For a chance to win either a stamp prize from Hampton Art or one of three collection kits from Echo Park Paper, please continue on the blog hop leaving a comment on each blog. Winners will be selected and announced both on the Echo Park Paper and Hampton Art blogs on Monday, April 29th. All comments are due by Sunday, April 28th at midnight EDT to qualify. Echo Park Paper <----Did you leave a comment for great paper packs? Other: Brown Cardstock, Brown Ink by Ranger, Red and Blue Ink by Colorbox. 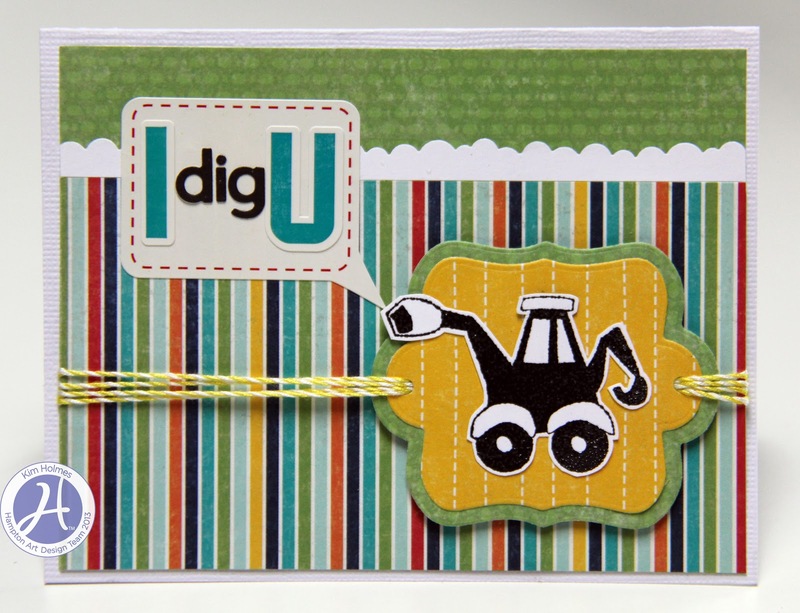 Ink: Colorbox and Stampin’ Up! Thanks for stopping by the Hampton Art blog! Fabulous projects! Particularly loving Leanne's cards and the card from Melinda is divine! These are all amazing projects! I love seeing the different ways our minds interpret the same theme. Vivian is truly inspiring...the details! They are all so cute ~ I love them all! Wow, the team has done an amazing creative showcasing of all the yummy papers from echo park!!! Those cards/layout are wonderful!!! so fresh looking, great photography crew!!! 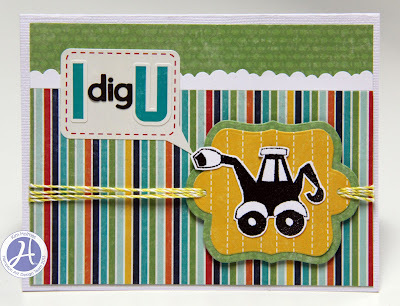 Super cute cards and layouts!!! Thanks for a chance to win!!! Great projects! So many cute ideas! These are all so cute! Thanks for inspiring me! What great cards. Love the little lamb. I loved seeing all the different styles of cards and the layouts! Such cute and creative projects! Loved the lamb card and the Hello Friend one especially. All the cards look great. Love all the variety. Super cute cards. Love them all. Wow! Awesome inspiration this morning!! Off to hop through the designers' blogs!! I just bought the "Bundle of Joy" kit, lovin' the cards made from it! Wow, amazing cards, love them all! Can't wait to check out the rest of the blogs! 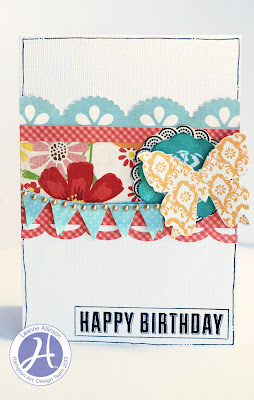 Thanks so much for the blog hop and the great inspiration! Great projects ladies! !So happy to be apart of this hop! Lovely combo of beautiful papers and stamps. Great cards! Beautiful projects! Wonderful stamp sets! Fantastic cards and layouts! lots of Inspiration and several creative New ideas. I love all these cards! I had fun hopping! Thanks for the chance to win. There are some great projects here. Thanks for sharing, thanks for the inspiration and thanks for the giveaway. Y'all are GREAT. I love all these beautiful projects! The stamp sets are awesome!! 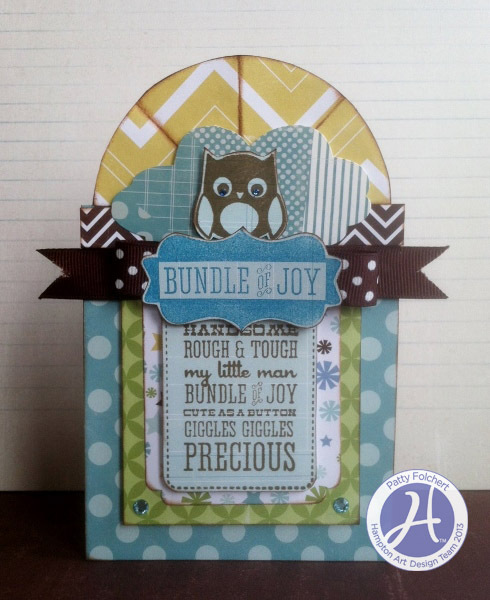 Such adorable cards and layout!! Love the products!! Delightful cards, ladies. Thanks for the inspiration and opportunity to win stamps. Fun inspiration by the DT. Thanks for the hop and prize chance. What great projects! The DT did an amazing job creating these! Some really adorable pieces! Great variety of projects using these wonderful products! 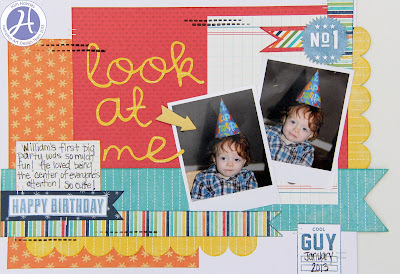 Love all the inspiration..especially the all about boy! I will be welcoming a son into our family soon and need lots of inspiration since I only have girls at the moment! 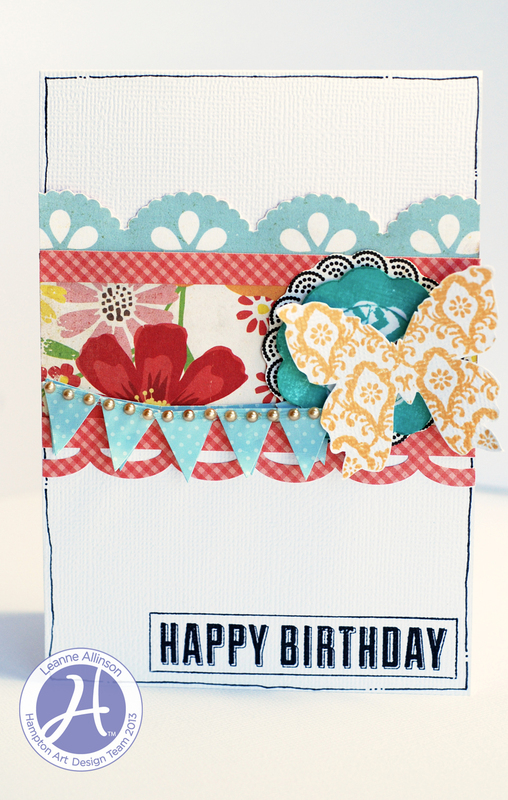 all the cards & layouts are so inspiring...thanks for the chance to win! Lovely projects! Just great to have coordinating stamps now. Great inspiration from DT. Loads of great examples here! Thanks for the chance to win. wonderful projects lots of great inspiring ideas here, thank you! Great ideas from Hampton Art! These two companies are a perfect blend! Thanks for the fun blog! Super cute stamps...love them all! Love the stamps and of course Echo Park is a great company to be partnered with. The cards are so sweet. Thanks for sharing. Cute cards ! Such talented designers ! Thanks for the chance to win ! Thanks for the fun hop! What wonderful and very talented people! Awesome projects, thank you for the inspiration! The little lamby card is toooo cute! I love the stamp sets. I can see a lot of greeting cards being made with the different stamps. Thanks for having the hop. I just finished and really enjoyed it. I am trying to decide which stamp collection I like the best. I liked the Scoot. I need more guy and boy stamps. But the Bundle of Joy is really cute. I need those too. 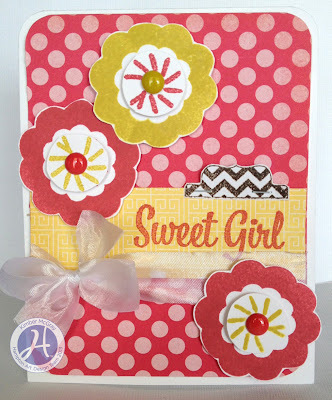 The Sweet Girl stamps are darling. I guess it's a three-way tie. Well, off I go to hop. What a bunch of lovely cards! Wow... That is a bunch on great cards. Each one's details are amazing. Great layout too. Love them all. Love the projects. I'm adding them to my pinterest! These are fantastic! Each project is really wonderful and there are so many different projects!!! Thanks so much for all the eye candy!!! Cool projects! Love the uses of both Echo Park and Hampton Art products! Fabulous projects! So glad these two fantastic companies are teaming up! I've already seen some of these amazing projects up close and LOVE them all! What a fabulous team up! wow! These are amazing! Fabulous work by your team and what a great pairing! Looks like a great teaming of companies. Lots of fun fun ideas too. Great companies to team up together. Great projects. wow! what a great group of projects! I absolutely love the About a Boy and the Sweet Girl, Oh Snap! Thanks for having the Blog Hop! Wonderful projects. I love it! These look so wonderful! I would love to win some of your beautiful papers (and, I would have to get the stamps, as well). Nice! Everyone did a fabulous job on their projects! Thanks for all the inspiration! 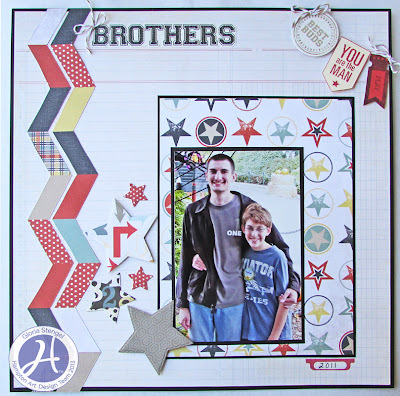 So many fabulous projects....I love them all! Ohh that hot air balloon stamp....I must have it! Nicole and Vivian's projects are right up my alley, wonderful inspiration! Beautiful cards. Thanks for all the inspiration! Super cute set of cards! Love the new stamps. The cards are spectacular! Love these stamps! 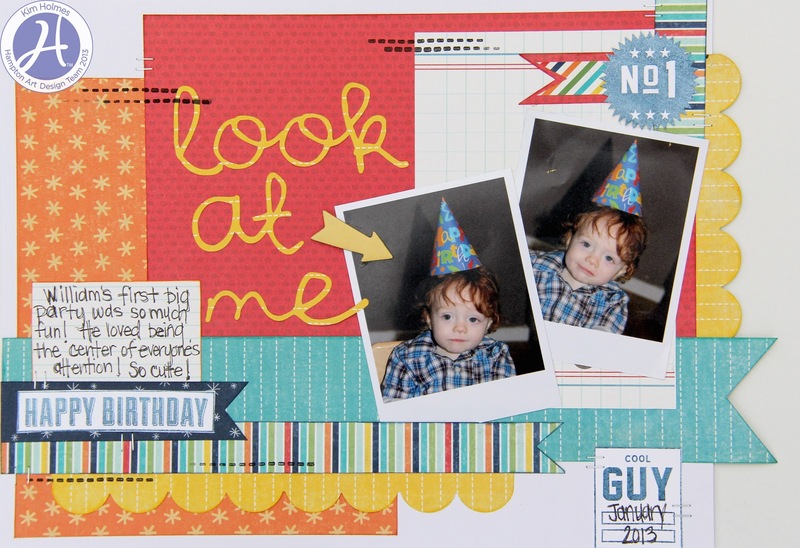 OMGosh, so many great projects, cards and page layouts. Not a stinker in the bunch. I would love to win the drawing. I need some new and exciting products to work with. TFS! Beautiful cards and layouts! I love all of your stamps! TFS! I am such a fan of Hampton Arts stamps! I have several sets that I love! I would love any of the stamps seen here on any of these gorgeous, creatively made samples!! Thank you so much for the inspiration and for sharing!! Have a super day!! That hello friend card is awesome! All the projects presented were awesome. Love your partnering with some of my favorite companies. Have loved your stamps for a long time. You've assembled a great DT. Wwwwaaayyy to go!!! You've surely set your path to great success. Thanks for providing a great service and still giving gifts to boot. I hopped and left a comment for everyone!!!!!!!! Love all the cards, SO inspiring!!! Fantastic projects! I love them all but I am partial to that little owl! Wonderful inspiration, thank you! WoW! Everyone did an amazing job, love all the cards! Lots of great inspiration! My first time to your site but won't be the last, hehe. Thank you and Echo Park for a super giveaway and a chance to win. Amazing!!! These are all fabulous examples of some super talent! I am really loving that little lamb card with the new EP line! 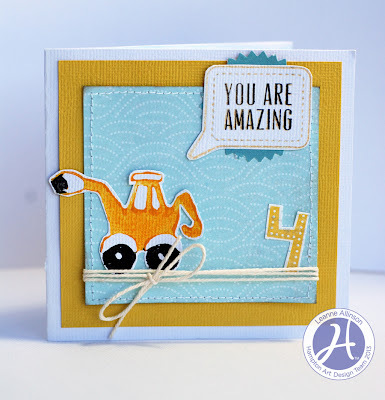 Hopping along--such pretty projects! Would love to win a prize! I love that my favorite paper company finally has stamps, and better yet, Hampton Art stamps! YAY!! I love stamping on my projects so I couldn't be happier. Those projects are adorable! What a great collaboration! Wonderful cards! What great cards! The Hello, Friend card is my favorite! 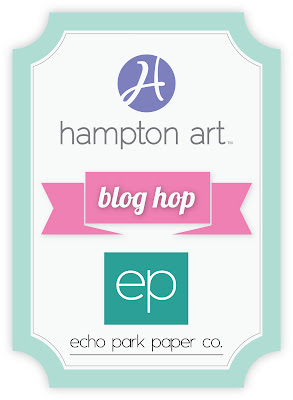 Hampton Art/Echo Park Blog Hop winner!